In a time when the pop charts seemed to go from one extreme to the other, with the super cool bands appearing on Top of the Pops with seemingly cheesy novelty acts, there were a few acts that easily bridged the gap both appealing to both the kids and grannies with their knockabout songs full of humour and the more serious bands, mainly due to their brilliant musicianship that demanded respect. 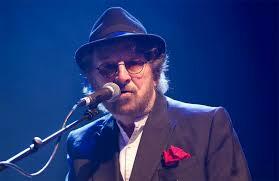 One of these bands was the North London Cockney duo of Chas and Dave; bassist Dave Peacock and pianist Chas Hodges, who died yesterday aged 74, who had a string of hits in the early 1980’s with songs such as Rabbit, Gertcha and their songs performed with their beloved Tottenham Hotspurs in support of their FA Cup victories. Chas, born Charles in North Middlesex in 1943, was much more, musically, though than a knockabout pub cockney piano player, having spent many years performing with musical greats as a much sought after and respected session/live band performer. Originally a guitarist, Chas claimed to have learnt piano having watched Jerry Lee Lewis when in his band as a teenager in the early 1960’s, Hodges played with bands such as Cliff Bennett and The Rebel Rousers, The Outlaws and in a short lived project with Roy Wood, Phil Lynott and John Coghlan called The Rockers. Bringing an unmistakeable style that was part boogie-woogie, part rock ‘n’ roll and part ‘knees up mother Brown’ Hodges talents developed and became well regarded and respected. 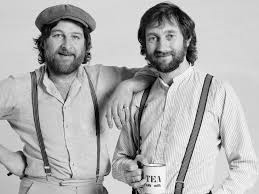 It is, however, as the duo Chas and Dave, that Hodges, and his big mate Dave Peacock, gained huge popularity with their songs that seemed like a link between the pub rock and punk that immediately preceded them in North and East London and the traditional music of their parents; having been born in war torn London, Chas and Dave’s music certainly had a bit of that Blitz spirit about it, a feeling of having a good time; with pint in hand songs like Rabbit and Gertcha had a sing along quality that appealed to young and old and the hip and the uncool. And as you’d expect from a band with music that relied on their ability to inspire audience participation and enjoyment Chas and Dave were engaging and energetic live performers. They played major festivals including opening for Led Zeppelin at Knebworth in 1979 and on the main stage at Glastonbury. But even though they played those massive stages they were still able to turn them into a North London boozer or music hall. 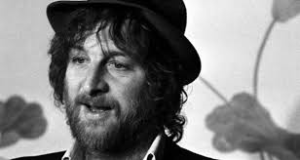 And that’s the thing about Chas Hodges, you always got the impression that he’d be happiest sat at a battered old Joanna in the corner of a pub, pint of Courage bitter in a dimpled glass on top, belting out one of his songs. And hopefully, wherever he is now, one can be certain that a party is just getting into full swing.